Software as a service (SaaS) is a way of delivering software over the internet as a service. It can facilitate you to simply access the software through the internet rather than installing and maintaining the software. This arrangement can make users free from complex hardware and software maintenance. With its flexibility, cost-effectiveness, mobility, and 24/7 availability can force it to use with biometrics and enhance the features of it. Nowadays fake logging is very common that create major problems for cloud users. So it is necessary to secure the logging process from unauthorized access in the cloud. Hence, the cloud is used for storing and maintaining the huge data on cloud servers with biometrics concept. With biometric-based security systems, there is no longer anyone needs to remember a large number of PIN’S and Passwords. Software-as-a-Service (Saas) based cloud model provides a lightweight and secure authentication mechanism. It is two steps of authentication. The first process is “enrollment” in which the biometric data converted into a binary form. The feature extractor then converts the binary string into a set of features. The second process is “verification”, the same process will be processed when the user login to the cloud. The matching module matches the features of the stored data and login data. Thus they have provided a service to do heavy weight cryptographic encryption and decryption operation on user’s biometric data. 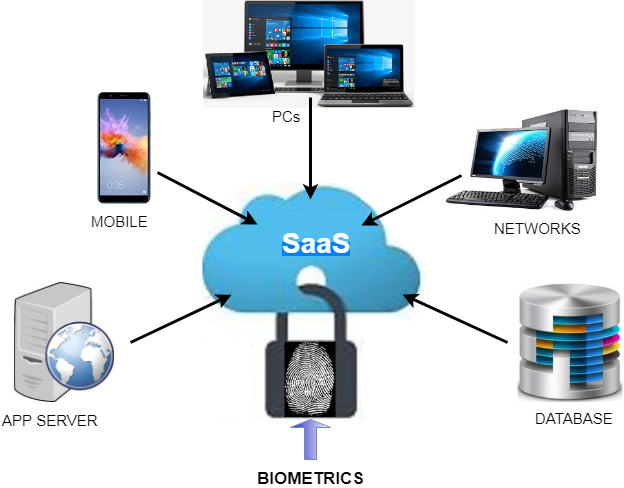 In this way, Software-as-a-Service (Saas) has revolutionized how we use software and technology with biometrics concept. Many big companies have applied the benefits of Saas to biometrics for gaining more user’s trust and attract them. SaaS costs are funded as an operating expense, so due to its cost-effectiveness products are available for small and midsize organizations. Saas can also deal with the server hardware updates and provides bug fixes and feature improvements instantly to all its customers.